We are a coveted business organization engaged in catering to the variegated requirements of the customers by bringing forth durable Corn Sheller. 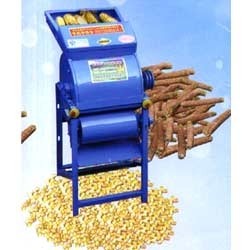 Under this affordable range, we offer Corn Thresher Sheller Machine, Corn Thresher Sheller Equipment. Developed in adherence with the industry set guidelines under the guidance of our experts, these Shellers are manufactured to separate cob from the corn. High strength, optimum performance, low maintenance and longer service life are some of the features of these Shellers. Backed by a team of dexterous professionals, we have been able to provide the customers with a remarkable assortment of Corn Thresher Sheller Machine. Used to separate the corn from the corn body, these corn threshers are compact in design, which separates the corn without breaking the corn cob. High in capacity, our offered corn threshers can separate the corn from the its body and throw the corn cob at the same time. Looking for Corn Sheller ?